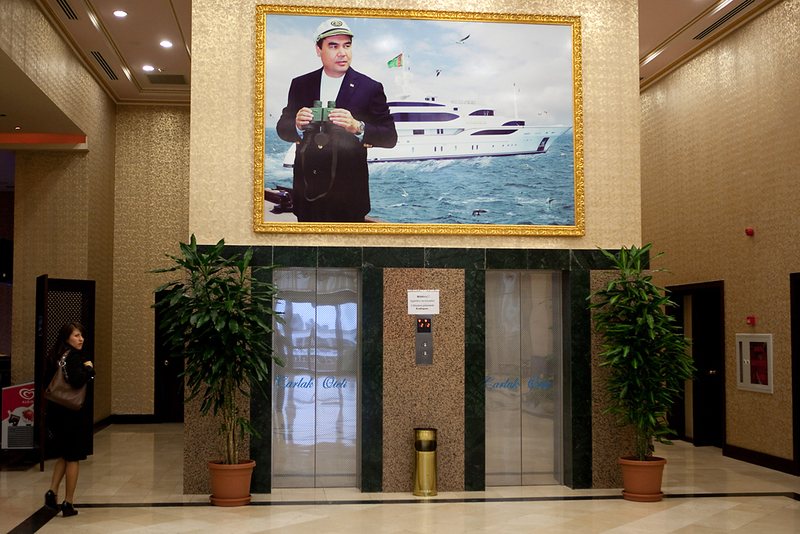 Turkmen President Gurbanguly Berdymukhamedov poses for a photograph with his yacht Galkynysh ("Revival"). 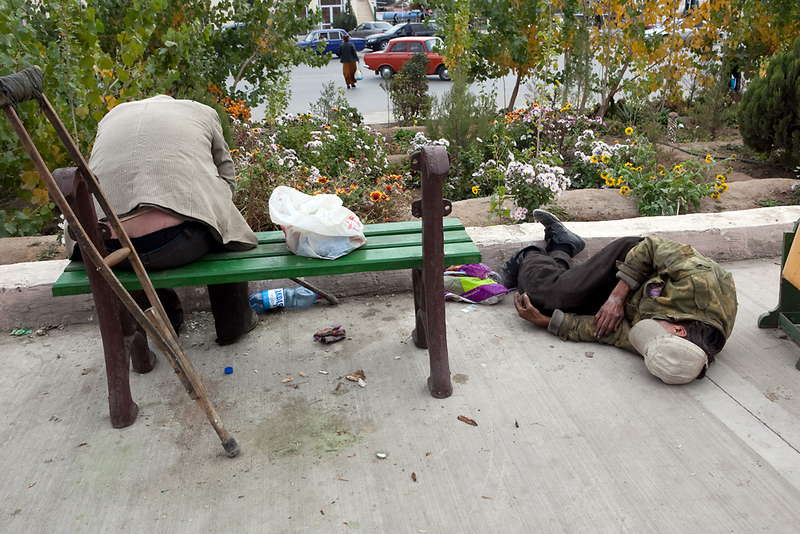 Homelessness and vagrancy are common in Turkmenbashi. Such signs of poverty would be swiftly removed from the capital Ashgabat. Turkmenbashi was established by Russians in the late 19th century as they pushed into Central Asia from the Caspian coast. 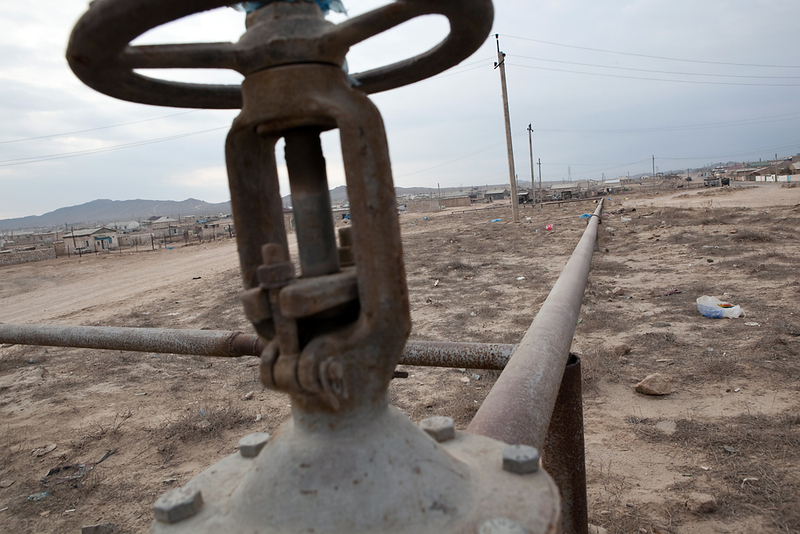 The city is the center of Turkmenistan's oil and gas industry. 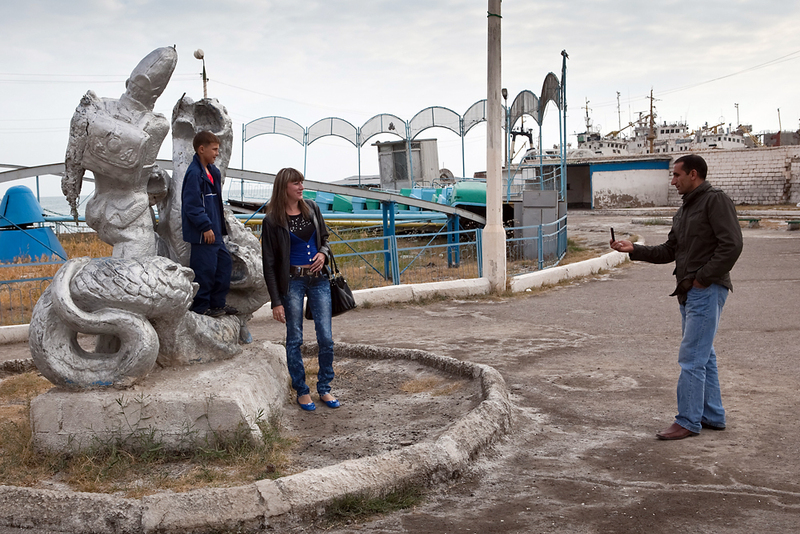 A family tours Turkmenbashi's derelict amusement park on the shore of the Caspian Sea. 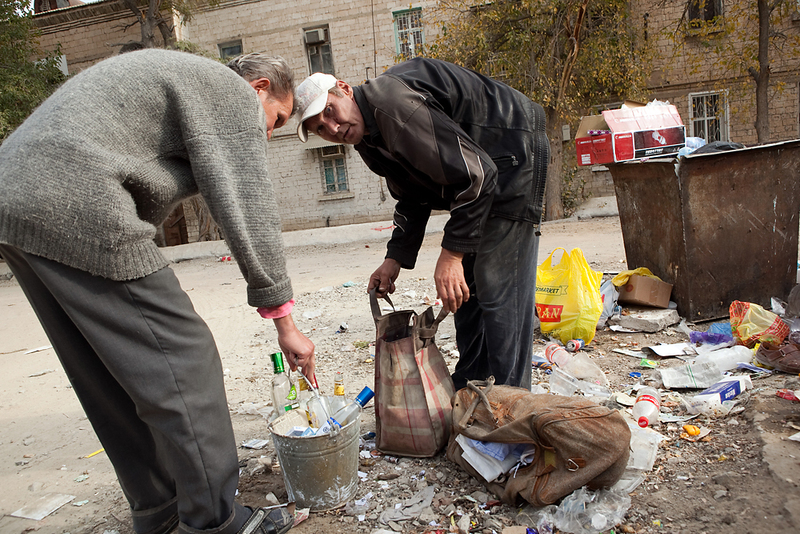 Men search for recyclable materials in a trash heap in central Turkmenbashi. 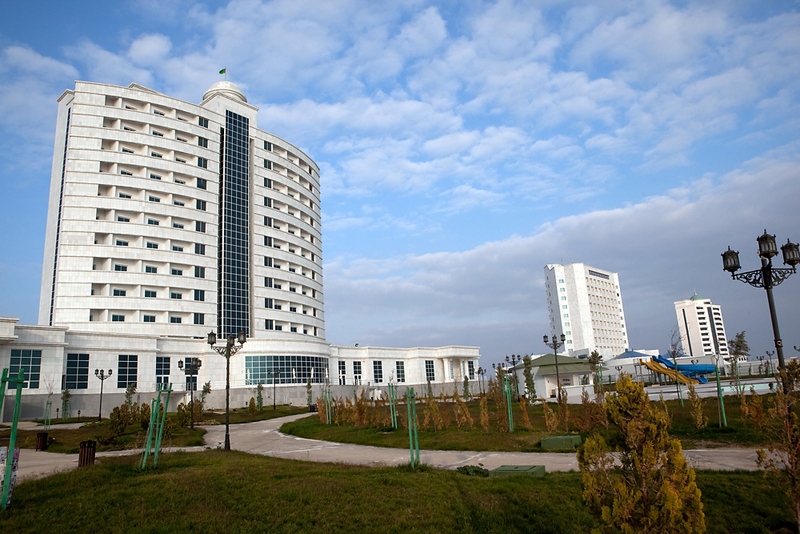 The Avaza resort rises from the desert on Turkmenistan's Caspian coast, some 12 kilometers from Turkmenbashi. Locals say the rooms in the mostly empty state resort - reportedly costing billions of dollars - are too expensive for them. 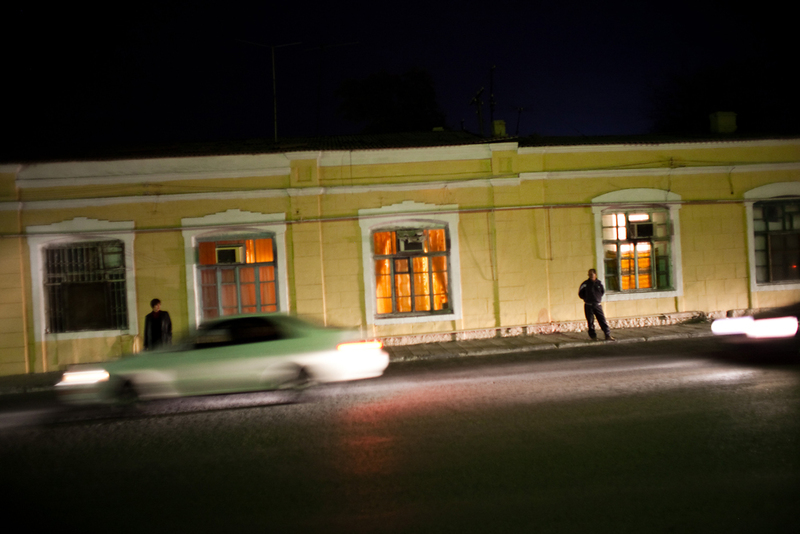 Men pass by Turkmenbashi's Tsarist-era train station, lit by floodlights at night. 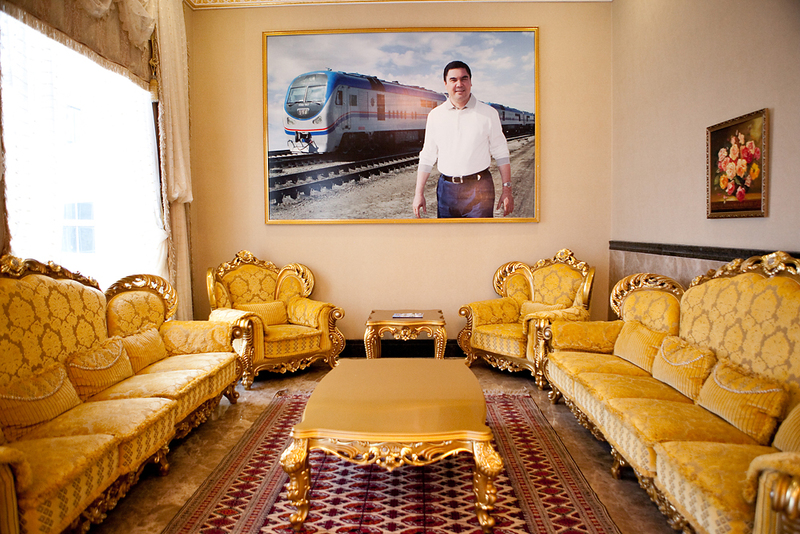 Large photographs of Berdymukhamedov grace the lobbies of every hotel at the Avaza resort. Boys fish from a rusty boat in the polluted harbor. 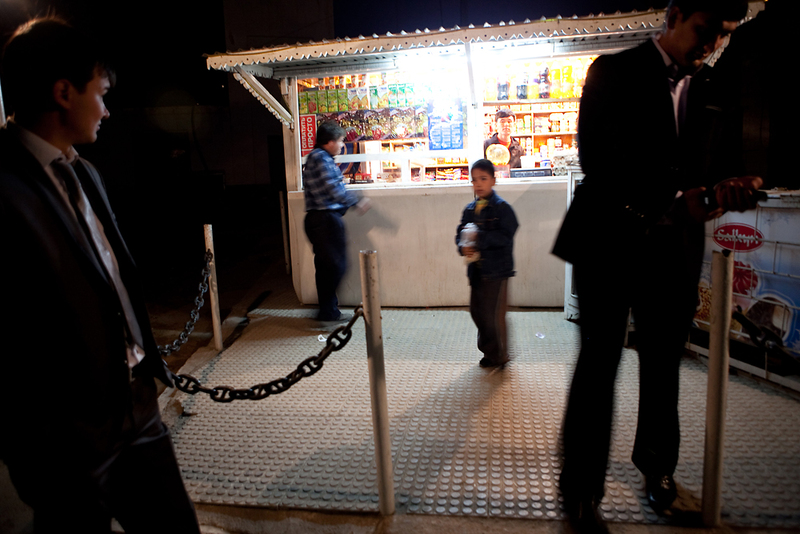 People shop at a kiosk in Turkmenbashi in the evening. 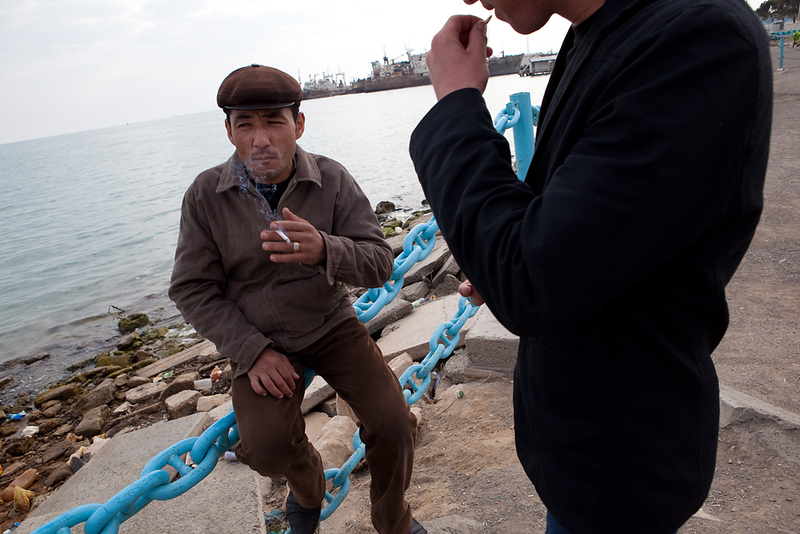 Men relax at the Caspian Sea harbor of Turkmenbashi. Many buildings in Turkmenbashi - formerly Krasnovodsk - were built in Tsarist and early Soviet times. 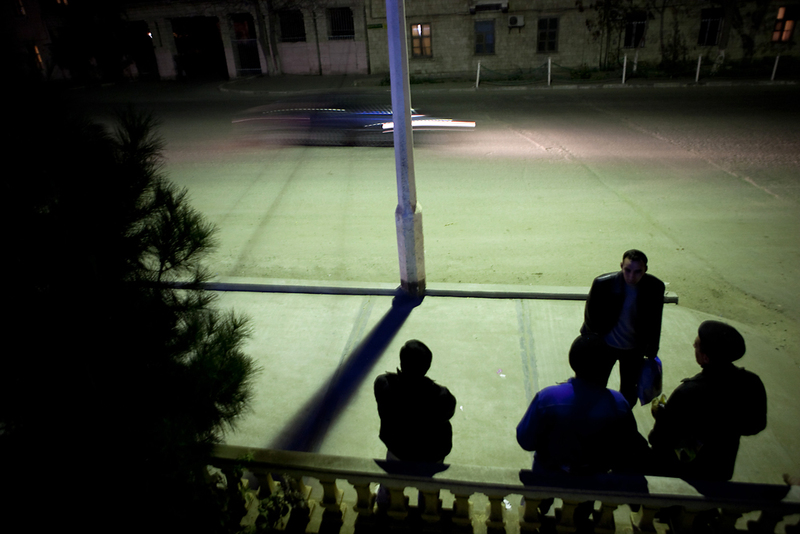 Men gather at night on a street in Turkmenbashi for conversation and company. 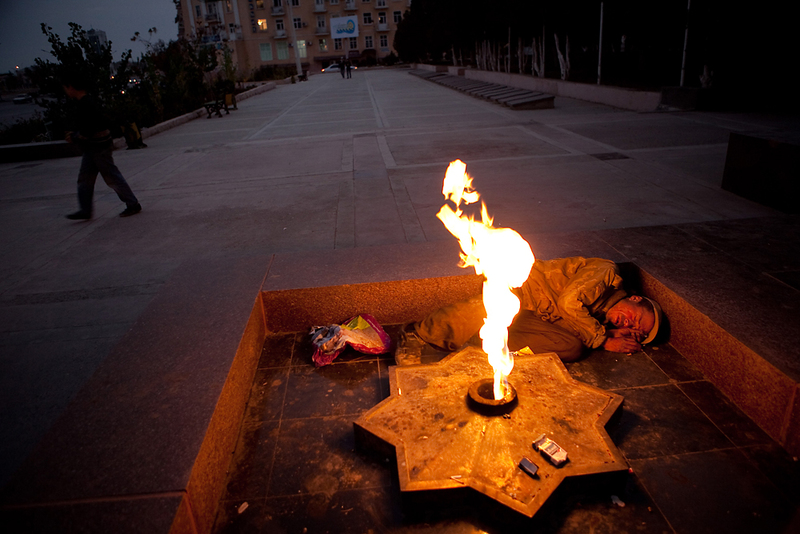 Intoxicated, a man sleeps next to the eternal flame on Victory Square, which marks the win over Nazi Germany in WWII. For a country with the world’s fourth-largest gas reserves, Turkmenistan has a predictably glitzy capital, Ashgabat. And it would stand to reason that the prized Caspian port city an hour’s flight away, at the heart of the nation’s oil and gas industry, would be just as grand. 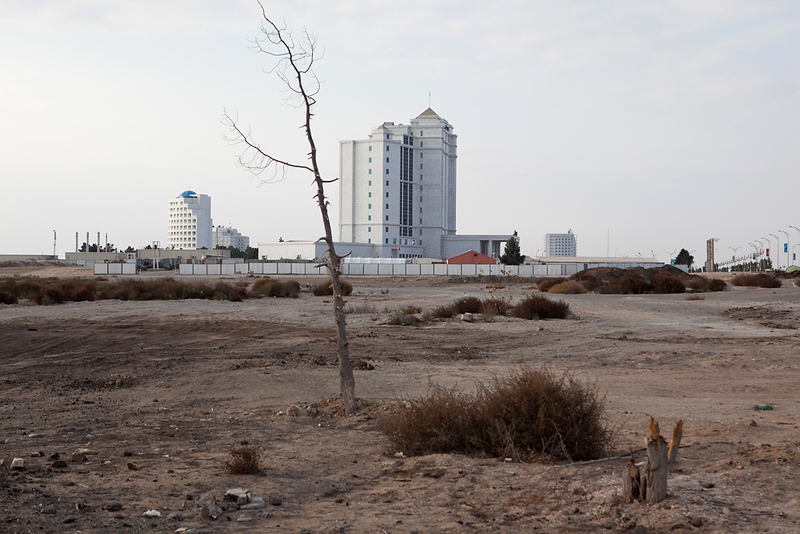 Turkmenbashi was named by and for the country’s late dictator, Saparmurat Niyazov, the self-styled “Leader of All Turkmen,” and has been chosen as the site for Turkmenistan’s stab at upscale tourism. But the only people visibly benefiting in Turkmenbashi and its environs seem to be high-placed government officials on their occasional visits. Otherwise, it is a rusty post-Soviet town, billions of dollars away from the capital’s marble, gold and flood-lit fountains. 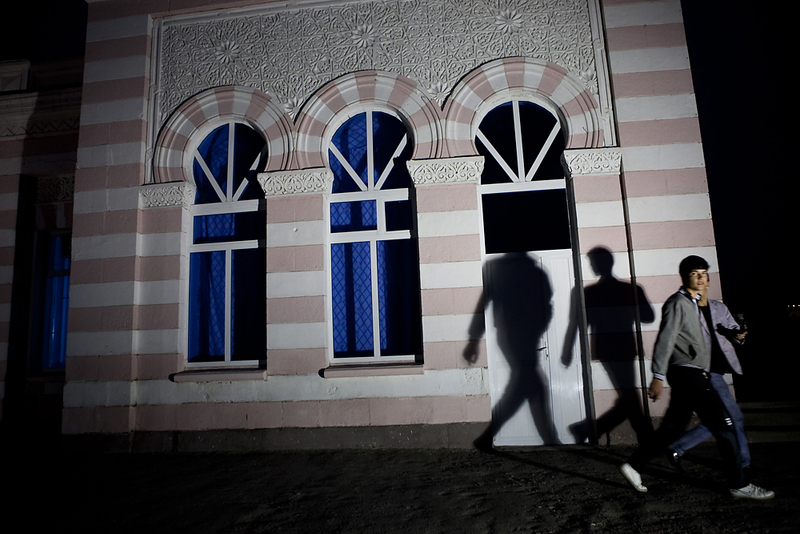 In Turkmenbashi, poverty, a well-guarded secret in Ashgabat, is out of the closet. Drunken vagabonds beg beside the all but holy eternal flame commemorating World War II, later sleeping within its warm reach. 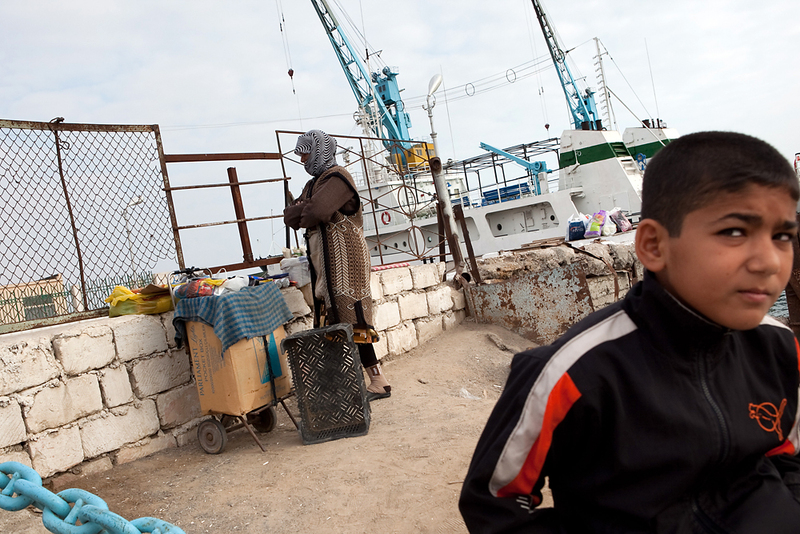 The destitution is as bad as in some of the poorer parts of Central Asia. Some 12 kilometers away, on an isolated stretch of windswept beach once famed for its simple summer homes, President Gurbanguly Berdymukhamedov has launched the country’s latest megaproject, the Avaza Tourist Zone. So far, six swank hotels have opened, mirror images of each other, constructed with billions of dollars from the state budget. A recent visit revealed ostentation but no guests: faux-Louis XIV furniture, chipping marble and billboard-sized portraits of the president fill each lobby. Locals hope the boom means jobs. But the government has stalled on promises to ease the country’s notorious visa regime. Without visitors, Avaza looks simply like another vanity project benefiting foreign construction firms and, possibly, elite pocketbooks. In Turkmenbashi itself work is not always easy to find either. The city, with a population just under 100,000, is home to a large minority of ethnic Russians and Azeris; government jobs are essentially unavailable to them, some complain, because of Turkmen language tests. Since Turkmenistan’s independence from the Soviet Union, the Russian language has become unfashionable, though it is heard among the fair-haired children on the streets, and some residents still refer to Turkmenbashi by its Russian name, Krasnovodsk. A number of buildings date from tsarist and early Soviet times, when the city was a transportation hub, important as much for its hydrocarbons as for its railway link to points east. Downtown, in the lobby of the only new hotel there -- where British, Malaysian and Turkish oil workers occupy all single rooms -- Berdymukhamedov, sporting an outfit uncannily similar to Popeye’s, poses for a photograph with his yacht Galkynysh ("Revival"). According to wikileaked cables purportedly sent by the US Embassy in Ashgabat, the 60 million-euro vessel was a gift from Russian gas-trading firm Itera as it sought concessions in the Caspian. Hotel staff confirmed that the boat, moored across the street behind a few frail conscripts, belongs to the president. Not far from the presidential yacht, shielded by a fleet of half-sunken, rusting naval ships, several boys cast lines into an oil slick, trawling for dinner.